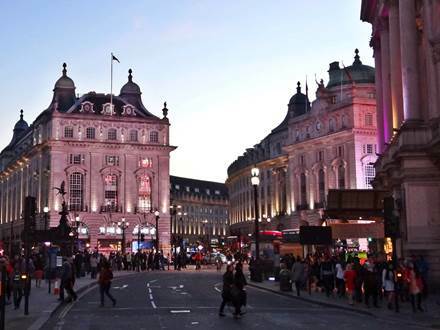 Tip: Hamleys is a special highlight for all children and those who would gladly be one again. The giant toy store on Regent Street is the place, where the small ones will have many wishes and the big ones only one wish, to be a child again. 1. The world's largest Asics Store is located at no. 249-251. The sporting goods manufacturer opened this ultra-modern shop with 3 floors in the summer of 2017. Beside a wide range of running shoes and clothing you will also find lifestyle fashions like the Asics Tiger Sneakers. Nevertheless, the runners will not come off badly. There is a special room where you can find your perfect running shoe with the help of running machines and computer analysis. 2. 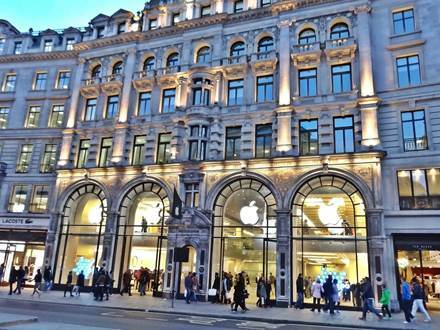 The Apple Store on Regent Street no. 235 opened in the year 2004 and was the first shop of Apple in Europe. 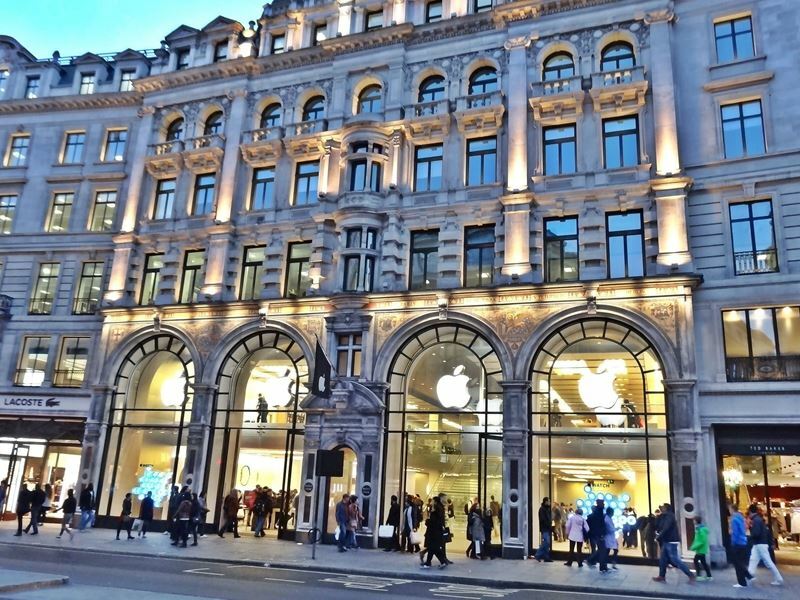 Today, it is one of the biggest Apple stores in Europe, as well as another store in London, in the nearby Covent Garden. The mixture of a classical building with the modern interior is worth a visit even if you are not a technology freak. 3. The toy store Hamleys (no. 188-196) is certainly the highlight of all the flagship stores on Regent Street. Not only the eyes of the children will shine in this colorful surrounding. On 7 floors with a total sales area of over 5000 m² you will find almost everything from the toy universe and have some possibilities to test some selected toys yourselves. Additionally there are some stalls with nice sales staff where they present their products with a lot of passion. 4. The Burberry flagship store (no. 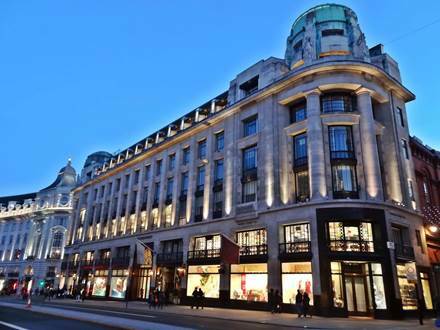 121) is a luxury temple of the world-famous British fashion Brand. The company was founded over 150 years ago and is especially known for the Burberry tartan-check pattern. 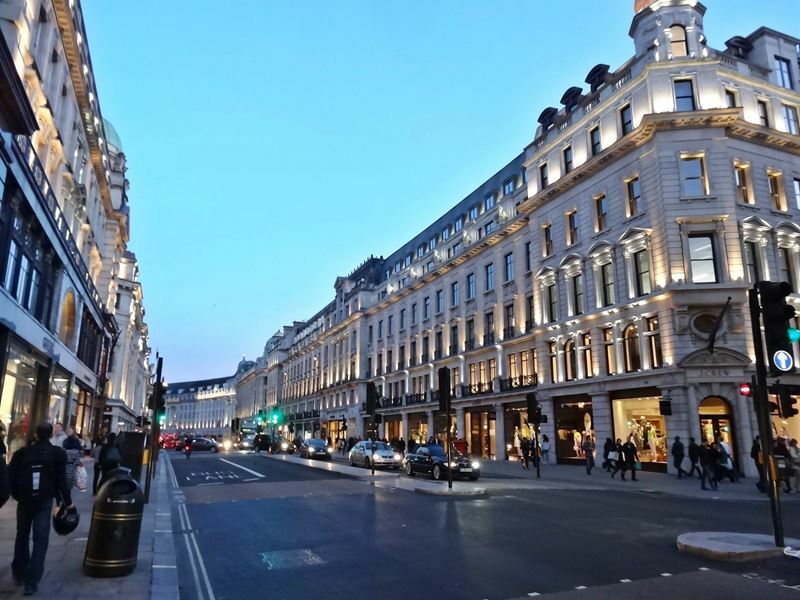 The shop on Regent Street was reopened in the year 2012 and presents at over 4000 m² women's, children's and men's fashion, shoes and accessories in a luxury surrounding. The theme of the shop design is the merging of the physical and the digital world. Therefore more than 100 screens are integrated in the product presentation at the stylish arranged sales area. 5. The Superdry store (no. 103–113) was opened in the year 2011 and the interior is decorated with a lot of wood and metal in a modern styled used look. The young British fashion label is known for its casual fashion with vintage style. 6. The Hollister shop (no. 87–97) is the first international flagship store of the American fashion chain in London and was opened in the year 2012. Large parts of the sales room should look like a surfer shack and have only a dim illumination which is a special mark of this brand. The fashion should embody the Southern California lifestyle and is very popular with teenagers. 7. In the Hunter branch (no. 83-85) you will find high quality outdoor fashion. The traditional Scottish company is especially known for its high-quality boots which they offer since more than 160 years. Additional to the boots they sell also jackets, coats and accessories, which will keep you warm and dry even in the worst weather conditions. The shopping spot in the Regent Street is located between Oxford Circus and Piccadilly Circus. The road has partly 4 lanes and is usually crowded with buses and cars. On a length of about 1 km, you will find a high density of flagship stores. 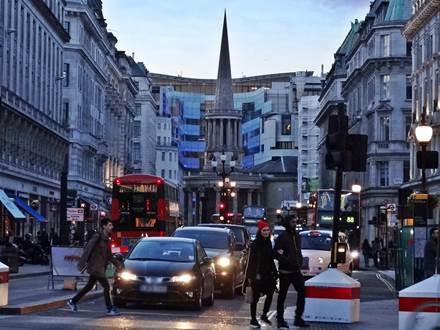 Due to the excellent location in the center of London there is a strong demand for business premises in this area. 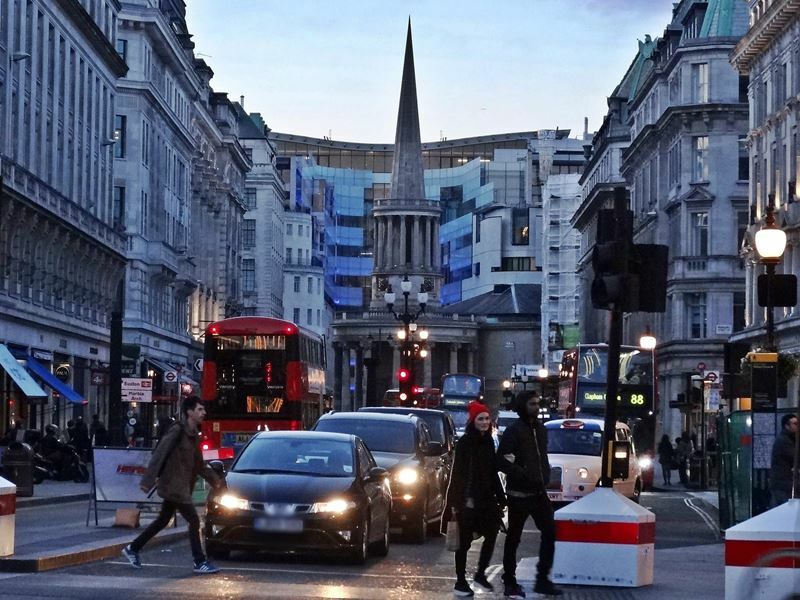 Just north of Oxford Circus, the road ends at a very distinctive building, the All Souls Church. The circular designed entrance area is already well recognizable from a distance. To the south of Piccadilly Circus you will still find some shops, but the further you move away from the place the quieter it will get in this section of the Regent Street.